The videos below are available on our YouTube playlist for Physics Demonstrations. 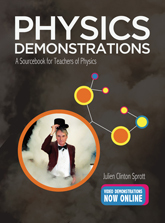 For complete information about the accompanying book, see Physics Demonstrations: A Sourcebook for Teachers of Physics. In an evacuated glass tube, objects fall at the same rate independent of their size, shape, and mass. The distance an object falls in the gravitational field of the Earth provides a sensitive measure of short time intervals. A car rolling across the table fires a projectile straight upward and subsequently catches it, illustrating that the horizontal velocity of a projectile is independent of the vertical force on it. A projectile aimed at a stuffed monkey hits the monkey despite the fact that the monkey begins to fall at the instant the projectile is fired. The property of inertial mass is illustrated by pulling on a string attached to the bottom of a heavy ball that is suspended by an identical string until one of the strings breaks. A glass beaker, partially filled with colored water, rests near the edge of a table on a cloth that you rapidly pull out from underneath the beaker without spilling the water or breaking the beaker, illustrating Newton’s first law of motion. A pail of water swung around a vertical circle without the water spilling illustrates Newton’s first law of motion. A revolving ball released at a certain point in its orbit moves in a straight line in the absence of an external force, illustrating Newton’s first law of motion. Objects sliding or rolling down an inclined plane illustrate friction and moment of inertia. A bowling ball suspended from the ceiling by a thin stainless steel wire illustrates the simple harmonic oscillator and the conservation of energy. A can, when rolled across a table, comes to rest and then rolls back to where it started, illustrating the concept of stored internal energy. Five stainless steel balls suspended in a row from above demonstrate conservation of momentum and energy in nearly elastic collisions. Toy rockets illustrate Newton’s third law of motion and the conservation of momentum. A rotating chain retains its circular shape as it rolls across the lecture bench and objects in its path. A large wooden spool (or yo-yo) with a string wound around it from below can be made to move either in the direction in which the string is pulled or in the opposite direction depending on the angle of the string. A bicycle wheel attached to a wire with a fishing line swivel and suspended from a support makes an impressive gyroscope. A stack of cards illustrates the static equilibrium of a rigid body by showing an impressive overhang. A rubber band near the top connects two rigid pendulums with the same resonant frequency, causing the energy to transfer back and forth between the two. A spring pendulum constructed such that the torsional and longitudinal frequencies are nearly identical slowly transfers its energy back and forth between the two modes of oscillation. Various pendulums exhibit chaotic motion when subjected to a nonlinear restoring force. By repeatedly flipping a coin to determine the direction to turn, one can execute a random walk. Two hemispheres when placed together and evacuated cannot be pulled apart because of the atmospheric pressure. A fluid such as air flowing over an object such as a balloon reduces the pressure above the object and levitates it. Objects placed in a bell jar connected to a vacuum pump expand when the jar is evacuated and contract when air is readmitted. A small amount of water placed in an aluminum soft drink can is brought to a boil over a Bunsen burner, and then the can is inverted in a bath of cold water, causing it to collapse instantly from the rapid condensation of the steam. A specially constructed, glass flask containing water and suspended from above by a chain spins rapidly when heated from below. A model geyser consisting of a column of water heated from below with a Bunsen burner erupts periodically and shoots water up to the ceiling. Water at room temperature in a flask boils vigorously and then turns into ice when the pressure in the flask is reduced. Holding an ice cube or crushed ice against a sealed flask containing a mixture of hot water and steam causes the water to boil. Objects placed in liquid nitrogen change their physical properties because of the reduced temperature. Liquid nitrogen poured over the hand causes no harm because of the heat capacity of the hand and the insulating layer of nitrogen vapor. The rapid evaporation of liquid nitrogen inside a steel cylinder exerts enough pressure to blow a cork stopper off the cylinder. 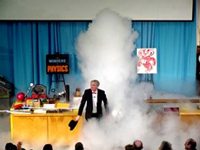 Liquid nitrogen induced to vaporize rapidly by expelling it from a large Dewar flask under pressure cools the air and causes the formation of a large, dense cloud. A candle extinguishes when a tightly fitting glass cylinder is placed over it unless a T-shaped piece of metal is lowered into the cylinder, illustrating natural convection. A match at the focal point of a parabolic reflector ignites by the radiation from an electrical heating element placed at the focal point of a second parabolic reflector across the room and aimed at the first. A collection of small ball bearings in an enclosure, with one side connected to a loudspeaker, exhibits random motion analogous to the molecules in a gas. Carbon dioxide from a glass beaker pours down a trough containing a number of candles that successively extinguish when contacting the invisible gas. A hollow sphere and a balance scale with a vacuum pump demonstrate that air has weight. A specially constructed balloon appears to have a lifting power far beyond that permitted by Archimedes’ principle. A helium-filled balloon attached to a heavy string rises until its buoyancy just balances its weight plus the weight of the string. Helium and hydrogen-filled balloons tethered by strings above the lecture bench burst when touched by a lighted match on the end of a stick. Soap bubbles blown with natural gas or hydrogen are ignited with a candle as they rise toward the ceiling. A cotton handkerchief or dollar bill is immersed in a liquid and set on fire, but the handkerchief or bill does not burn. A small amount of ethanol placed in a bottle is made to explode and blow a cork a considerable distance by means of an electrical spark. A cardboard box with a hole in one side produces smoke ring vortices. A rubber hose connected to a source of compressed air dangles from a support and flails about in a chaotic manner. A dripping faucet illustrates periodic and chaotic behavior and the period-doubling route to chaos. The difference in wave propagation speed for transverse waves on ropes of different masses and tensions is illustrated with a stick and two 3×5-inch index cards. The speed with which sound travels through the air is illustrated with a microphone and oscilloscope. The peculiar sound of one’s voice after breathing helium or sulfur hexafluoride provides an amusing demonstration of the variation of the speed of sound with the density of a gas. An electric bell in a jar makes a sound that decreases in intensity as the air is evacuated from the jar. A reed mounted on the end of a rotating arm produces a tone whose pitch wobbles up and down as the arm rotates. A pipe several meters long filled with natural gas and connected to a loudspeaker produces a flame whose height varies with position along the length of the pipe. An oscilloscope displays the waveforms of various musical instruments showing the effect of frequency and wave shape on the sound. Two sound sources of equal amplitudes and nearly equal frequencies exhibit beats if the frequency difference is less than about 10 Hertz. A glass beaker exposed to a sufficiently intense sound wave at its natural resonant frequency will shatter. Various sources of sound with frequencies above the range of audibility illustrate the distinction between a physical sound wave and the perception of sound. A Wimshurst electrostatic generator produces high voltages at moderate currents to illustrate many principles of electrostatics. A Van de Graaff generator illustrates many principles of high-voltage electrostatics, such as making a person’s hair stand on end. A static electric charge on an insulator can repeatedly induce a charge in a conducting plate, raising the voltage to a high value and making sparks. A thin wire or strip of aluminum foil vaporizes when a large capacitor discharges through it. An electrical discharge occurs with a high-voltage power supply connected to a pair of conducting bars close together at the bottom and farther apart at the top, between which a discharge strikes at the bottom and rises to the top and then strikes again at the bottom. A Tesla coil, because of its high frequency, provides a relatively safe way to demonstrate phenomena associated with very high voltages and currents. A screen cage large enough for a person to enter used with a Tesla coil or Van de Graaff generator illustrates the fact that a closed conducting surface is an equipotential. A partially evacuated glass tube filled with various gases at low pressure and connected to a high-voltage electrical source illustrates properties of electrical discharges and plasmas. Specially constructed electrical circuits produce chaotic output that can be seen and heard. A permanent magnet brought near a cathode ray tube causes a displacement or distortion of the pattern on the fluorescent screen to illustrate the effect of a magnetic field on moving charged particles. A permanent magnet dropped onto a copper plate bounces upward without touching the plate because of the eddy currents induced in the plate. A coil of wire wound around a short, cylindrical, laminated iron core is energized to propel a ring of aluminum up to the ceiling. A large capacitor discharged into a low-impedance coil of a few turns produces a magnetic field of strength sufficient to crush an aluminum soft drink can. Alternating current in a pair of magnet coils produces a magnetic field of a shape and strength that is sufficient to stably levitate an aluminum ball. High-temperature superconductors used with permanent magnets illustrate the Meissner effect. A rainbow produced by passing a collimated beam of white light through a glass prism illustrates that white light consists of many different colors. The beam from a low-power laser permits a number of simple demonstrations. A sufficiently powerful laser bursts balloons from across the room. A laser beam passed over the top of a Bunsen burner produces a spot on the wall that twinkles like a star. A long, solid, plastic, spiral rod illuminated with a low-power laser illustrates the property of total internal reflection in a light guide. A stream of water illuminated with a laser or high-intensity white light acts as a light guide. A white light passing through a liquid scatters primarily the blue light causing the transmitted light to appear red, simulating the blue sky and setting Sun. Materials illuminated with ultraviolet light emit visible light. Reflections from a mirror mounted beneath a table give the illusion that a disembodied head is sitting on top of the table. An illusion in which a person or other object disappears and reappears illustrates the phenomenon of the partial reflection of light at the interface between two media. A visual image appears in midair when waving a light-colored stick near the focal plane of a slide projector containing a slide of some appropriate subject, illustrating the persistence of vision and the scanning process in television. Transparencies containing optical illusions projected on the wall or a screen illustrate the role of subjectivity in scientific experiments. Transparencies or computer images containing fractals are projected on the wall or a screen.